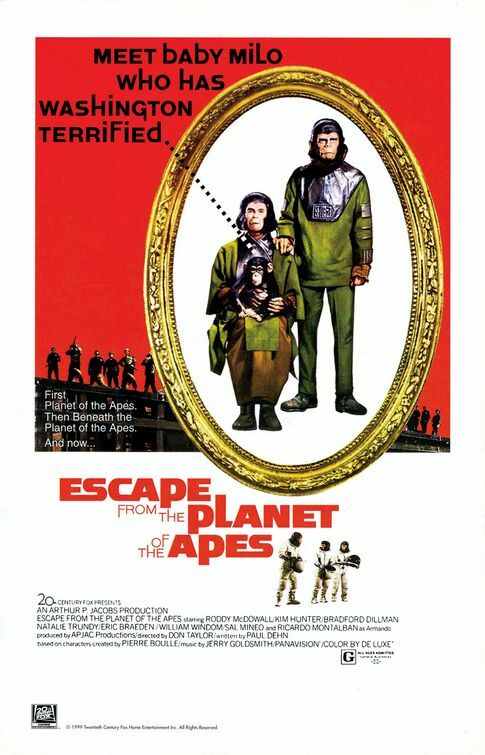 Not merely the best of the sequels, but as good in its own way as the original, this is the Apes movie that turns the series on its head. In the same way that The Incredibles is a better movie about The Fantastic Four than any of the official Fantastic Four movies (there have been three so far), Escape from the Planet of the Apes is a better representation of Howard the Duck than the movie based on that character -- it may even have influenced Steve Gerber in the direction that Howard took. The conceit is identical: but instead of a cartoon duck who's trapped in a world he never made, we have anthropomorphic chimps coming back from the future. And instead of satirical comic book villains such as Le Beaver or Dr. Bong, Roddy McDowell's Cornelius and Kim Hunter's Zira face the very real threat of extermination by the U.S. Government. Both Howard the Duck and Escape share a deeply cynical, not to say bitter, not to say bleak worldview and interpretation of '70s-era culture and society. In fact, with Hollywood's current lack of guts, it's safe to say that Escape could not be made today: among other things, the ending is so horrifying and so decidedly un-happy that no studio would allow it to go out. As the final scenes of Escape play out, you can imagine them calling for the script doctors. This would be Kim Hunter's last go-around in ape drag, but Roddy McDowell kept coming back as different characters for two more sequels and the TV show. There are lots of familiar faces in the supporting cast, including Eric Braedon as the film's main heavy. Braedon had done a few seasons on Rat Patrol, but I believe this was his only major film appearance before he took up residence on The Young and The Restless, where he can be seen to this day. It wasn't quite all downhill for the Apes cycle from here, as I'm sure I'll yammer at you about next week.